The Lienzo de Quauhquechollan is a pictographic painting on cotton cloth, created circa 1530. The Lienzois considered the first map of Guatemala. It is also the only firsthand indigenous account of the conquest of Guatemala, and one of the few sources to record the military campaigns of Jorge de Alvarado in 1527–1530. In 1520, the leaders of Quauhquechollan (today San Martín Huaquechula in Puebla, Mexico) formed an alliance with the Spanish, hoping to improve their social and political situation and to oppose Mexica (Aztec) oppression. After the victorious campaign by the allied armies, the Quauhquecholteca painted the Lienzo to document their role in the conquest of Guatemala and confirm the privileged position they sought as co-conquerors in the new political system. The exhibit of the Lienzo de Quauhquechollan brings to life this untold story of Guatemala’s conquest. Visitors watch the animated narrated video that brings to life the events recorded in the Lienzo. Full-scale jigsaw puzzle helps visitors visualize how the Lienzo may have been viewed centuries ago. The exhibit’s seven stations have benches and plasma screens. Visitors may also request chairs. Knowledgeable guides speak English and Spanish and are available to answer your questions. 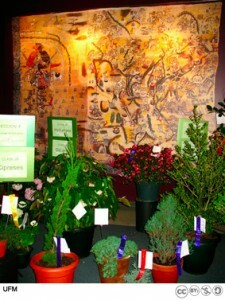 People of all ages love the hands-on experience of the full-scale Lienzo jigsaw puzzle. 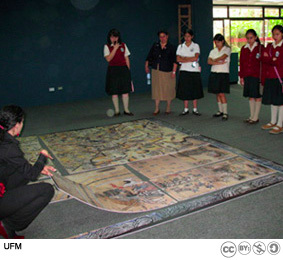 In 2006, Universidad Francisco Marroquín embarked on a project to bring the Lienzo de Quauhquechollan to Guatemala, so that Guatemalans could learn, from this primary source, about the history of their country. UFM decided to create a digital version of the Lienzotogether with an exhibit that could travel around the country (and the world). One thing led to another, and the project expanded into a full-blown digital restoration. We assembled an extensive team of experts—in the fields of anthropology, archaeology, epigraphy, ethnobotany, digital technology, graphic design, history, lighting, photography, storytelling, and textiles—who worked hand in hand with the digital restorers, animation programmers, script writers, and narrators. The entire project—restoration, animation, narration, video, and catalogue—took almost nine months. Deterioration of the original Lienzo has made many symbols and scenes difficult to understand, even when closely examined by experts. Modern technology has allowed the Lienzo de Quauhquechollan to be restored to an extraordinary depth and level of precision that would have been impossible to achieve on the original without destroying the cloth in the process. Get a behind-the-scenes look at the Lienzo de Quauhquechollan digital restoration project. 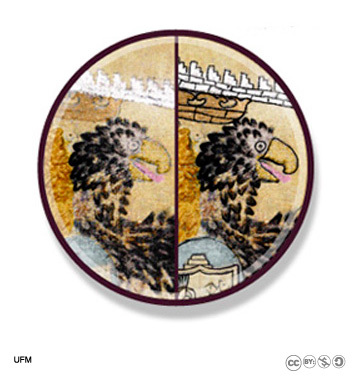 The Lienzo’s double-headed eagle before and after the digital restoration. An exact reproduction shows the original Lienzo in its current condition and actual size. Clearly, the wear and tear of 500 years have taken their toll and many details are faded, making it difficult to understand. The digitally restored version is displayed in the same size as the original. In this version, the damage has been repaired and the lines and colors brought back to life. The restored version shows what the Lienzo may have looked like when it was new, and has allowed scholars new access to this document’s historical record. 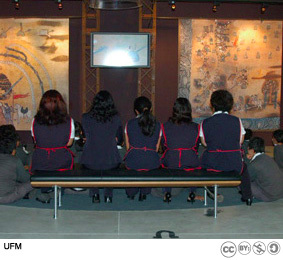 The exhibit at UFM is divided chronologically into seven stations, arranged as the Lienzo de Quauhquechollanshould be read. It begins with the alliance formed between the Quauhquecholteca and the Spanish. Each station describes one of the military campaigns recorded in the Lienzo. 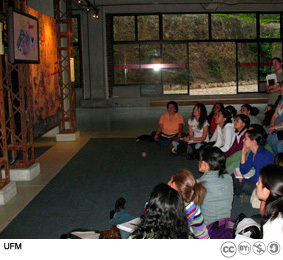 At each station, an animated narrated video recounts the events much as a Quauhquecholteca storyteller might have done. The stations are all equipped with a plasma viewing screen and a sound pod. Each station also features enlarged reproductions of the relevant section with brief explanatory texts in English and Spanish. Hoof prints and footprints—like the ones that mark the conquerors’ route in the Lienzo itself—are painted on the floor to guide visitors to the next station. Two more stations help the visitor understand the pictography in the Lienzo. One explains the symbols; the other locates the geographic places represented in the Lienzo on a modern map. As you leave the main exhibit, a puzzle version of the restoredLienzo, in its actual size, is set up on the floor. Its 15 pieces correspond to the original 15 panels of cotton cloth that were sewn together 500 hundred years ago to create the canvas. If you look carefully you can see the stitching along the seams. This interactive exhibit gives visitors a chance to view the document—from above—as it was meant to be seen centuries ago. Children visiting the exhibit are encouraged to play with the puzzle and put it together on their own. 1. How much time do I need to see everything? Allow between 40 and 45 minutes to see the entire exhibit with the narrated video. 2. What if I don’t speak Spanish? The narrated video is available in either English or Spanish. All of the stations have explanatory texts written in English and Spanish. The guides are very knowledgeable about the Lienzo’s content and the digital restoration process. They speak English and Spanish and are happy to answer questions. 3. Do I need a reservation? Individuals do not need reservations to see the exhibit. Groups interested in a guided tour need to make a reservation. The exhibit is open Monday through Friday 9:00 a. m. to 1:00 p. m.
We want to hear from you! Contact us to share your thoughts and ask questions. 4. Is there anywhere to sit? Each of the seven stations with narration has a large bench for watching the video. Chairs with wheels that can be easily moved around the exhibit hall are also available for visitors upon request. 5. What about guided tours? Guided tours are available for groups that have made a reservation. Guided tours last a little more than one hour, and can be adjusted to accommodate the needs of the group. School groups, K-12, are admitted with a cost of Q5.00 per student, with prior reservations. 6. Can I take children? Children of all ages are welcome to visit the exhibit. 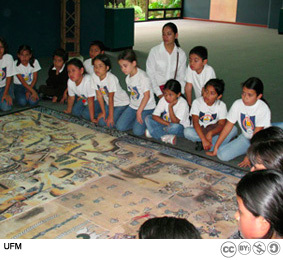 Children ages 10 and older, who have studied some history of Guatemala and the conquest, will get the most out of it. Strollers are permitted for babies. Visitors are invited to take photographs of the exhibit. Video photography, however, is not permitted. 8. Is the university campus open to visitors? Yes! Visitors are very welcome on UFM’s campus. 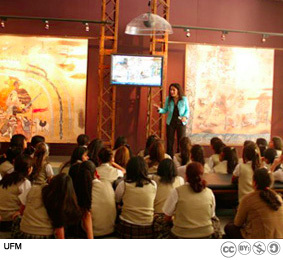 Since opening in February 2007, more than 18,000 people from around the world have visited the permanent exhibition of the Lienzo de Quauhquechollan. Thousands of these are elementary and high school students, who visit the exhibit with the cost of Q5.00 per student, thanks to generous support from Banco G&T Continental. Garden club exhibit at the Lienzo de Quauhquechollan. On the left side of the lobby of the exhibition area is a small gallery for temporary exhibits.